hi i'm khaylm and i live in glenorchy. i'm eight years old and i love tramping. I have recently gone into steele creek hut and that was pretty long. when i got to the hut i was extremely tired. the hut didn't smell nice and i thought i was going to spew. I have also been into dayles flat hut hut recently. It was a lovely hut but there were to many sandflies and the toilet smelled afual. this year i did the greenstone/caples track and i loved it!! last year i walked up to rees saddle and i went for a hunt with dad in the beansburn and we got to stay in the fly around hut. In 2006 i almost got to the harris saddle but the snow got to deep. 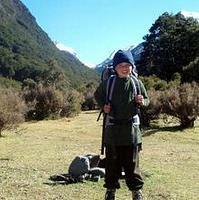 when i was 4 i walked into the routeburn falls hut and when i was 3 i walked into mid caples hut and routeburn flats hut. our next tramp will be scott creek/kay creek or earnslaw hut. when i'm older i want to work for doc and help them build tracks. my faverouite hut is in the greenstone and it is called slip flat hut.